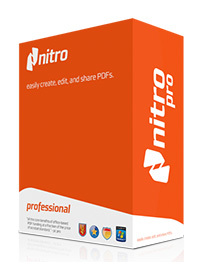 Nitro Pro lets you quickly and easily create professional-quality PDF documents from any format or content type: paper scans, spreadsheets, presentations, reports, and more. Create PDF and PDF/A documents from virtually any Windows file.Convert and merge files into a single PDF document. Edit images — insert, resize, rotate, crop, flip, replace, arrange, delete, and extract. Edit image properties — brightness, contrast, color space, and resolution. Edit pages — insert, delete, rotate, crop, extract, and replace. Add and edit bookmarks and links. Highlight text content with the Highlight, Underline, Cross Out and Replace Text tools. Add Sticky Notes, Text Boxes, and Call Out annotations. Add freehand drawings with the Pencil tool. Add drawing shapes, including lines, arrows, rectangles, ovals, polygons and clouds. Apply stamps to pages, choosing from standard built-in stamps or your own custom creations. Attach documents and other files to your PDF pages. Add explanatory text and other feedback to your markups. Filter comments based on type, author, status, subject, and more. Summarize comments for easy viewing alongside page content. View the summary as a PDF or print it for paper-based reviewing. Secure documents with passwords and certificates. Encrypt with 40-bit, 128-bit, and 256-bit level security. Apply restrictions on printing, copying, and altering PDF documents. Create and apply re-usable security profiles. Digitally sign and certify PDF files. Fill in, save, print and submit forms.